So many of you probably wonder how we find things to do in the different places we go and how we enjoy them. Let me tell you, after going to one place for a few months, you will have seen most of it. You will know which port of call is for sightseeing, which one is for shopping, for eating, which one has cheap drinks, and so on. One of the ports, we visited was Dubai. It was our homeport, so we spent quite a bit of time there. So here are 5 cheap things to do in Dubai, most of them close to the Cruise ship terminal. 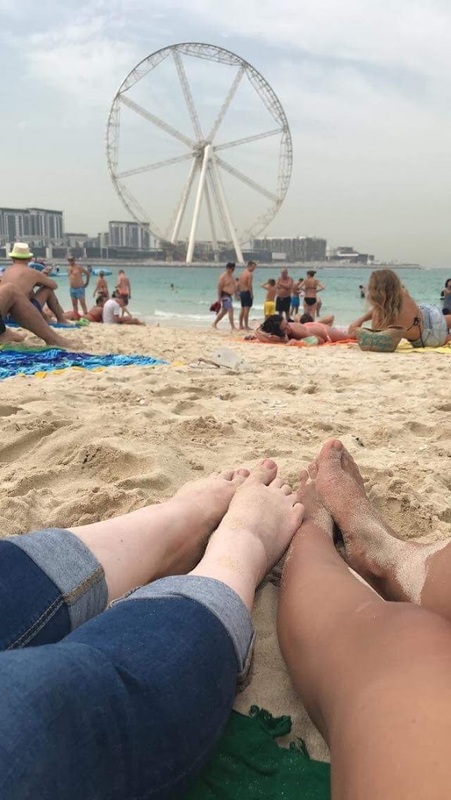 If you are looking for more information on Dubai and interesting fact she, check out this amazing post from My Travel Affais. If you haven’t heard of it yet, you are probably living under a rock. This is the historic part of Dubai, with a very touristy souq, and not just surrounded by skyscrapers. There is actually a bus that runs about every half an hour from the ship to the closest metro station (called Al Gubaiba), which will cost you 10AED and drop you off about a 2 minute walk from the creek. It will wow you with its charm and authenticity (even though it isn’t). The main attraction are the dhows. 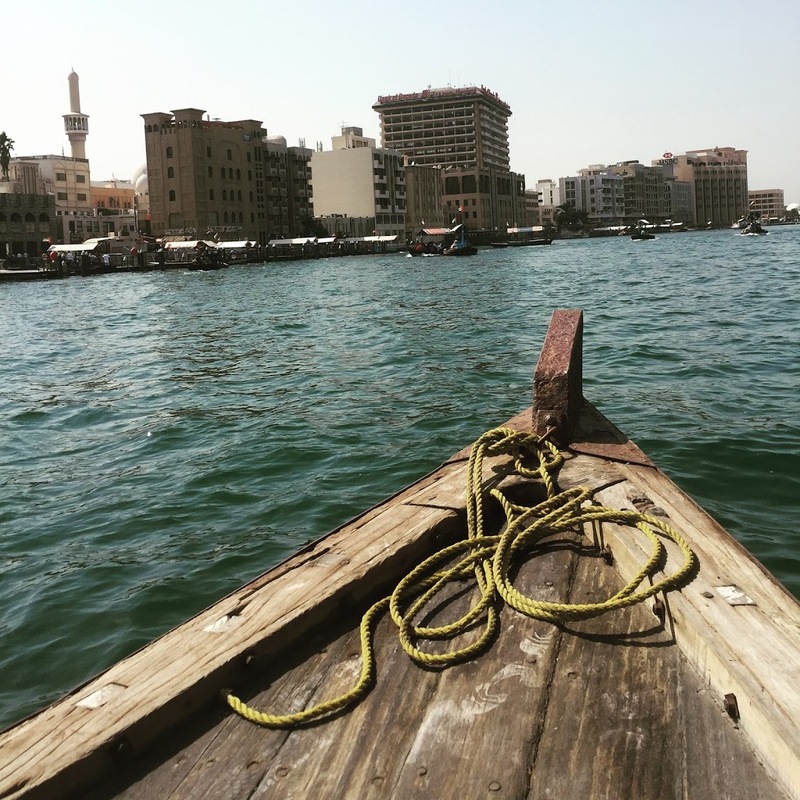 For 1AED, they will take you across the river, which lets you see the Creekside from a different perspective. Especially coming off a huge cruise ship, it can be fun to experience these small, not very safe dhows. Plus they get you to our next thing on the list. Another favorite of mine is just to stroll around the old souq on the other side of the creek. There is one street dedicated to just gold, where you can get a good price if you wanted to buy some. Most of the gold is imported from Italy but crafted here which makes it cheaper. The other streets sell mostly the same souvenirs you will find anywhere else as well, but here it’s all close together. It can be a little overwhelming and the vendors annoying when they always try and sell you things, but in the end, it is a great memory to laugh about. So when you first see the Dubai Museum, you will not think it’s that big of a deal. It is located maybe a 10-15 minute walk from the same bus stop mentioned in the Dubai Creek, so easy to get to. It is housed in an old small fortress and you can see outside some old ships and some other things. The entrance will cost you 3AED for an adult, which totally acceptable, but you will first think it is overpriced because all you see is the small courtyard. However, there is a whole renovated museum underground that shows the history of Dubai and what it’s development. It is very well done and definitely worth a look. From there about 5 more minutes by foot, you have the Al Fhaki Historical Neighbourhood. This area has been reconstructed to resemble the Dubai of the 19 hundreds. It is a great place to just wander around and explore all the little streets. They also sometimes have art or music festivals here which can be a lot of fun. While the mall itself is expensive, window shopping is free. There are many cool attractions within the mall worth seeing, such as the fountain, the Burberry corner which they had for a while, and many other things. It also has airconditioning, which is an added benefit if you’re coming here anytime, but winter. The mall is also connected to the promenade that leads you to the Burj Khalifa. It is one of the most iconic places in Dubai and a must-see if you visit. So hop on the free shuttle provided by the Dubai Mall between the ship and the mall, and enjoy an afternoon of fancy stories and interesting people. Okay, so this one may be a little bit of a stretch and can be adventurous if you want it to be cheap. If you want to do it the easy way, you can get a cab at the port, which will take you there, but it will probably cost you between 70 and 100 AED, depends on traffic. If there is a group of you, that may not be so bad, but it can still add up. So if you are feeling adventurous, take the metro. First, take the same bus to the metro station that you would use to get to the Creek, and then buy a metro card and go on your way. Since there are only two lines, it is not hard to navigate. Once you reached Jumeira Lake Towers, which is the closest station to the Marina, you can just walk. It will take you no more than 20 minutes to reach the beach and a beautiful promenade. You can spend the day laying on the free beach or walking around the beautiful area. Whatever you decide, it will for sure be an amazing day. So there you have it. 5 fun things to do in expensive Dubai that will cost you almost nothing. Hope this helped you enjoy your time in Dubai.